We went on a short holiday last week and I had a friend mind my dog while we were away. 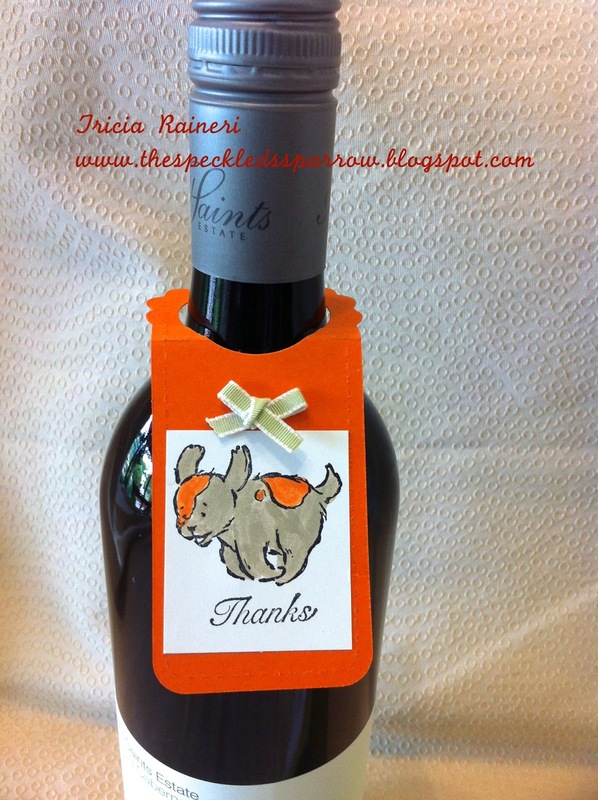 I needed a card and tag to decorate her bottle and here is what I came up with. Mind you I only had 10 minutes to make it to take to her! Tracy loves lime green and orange so that is why I have used those colours. It was way out of my comfort zone as I don't usually use either of those colours. How cute it that little dog. Funny thing was when I went to pick up my dog she ran off just like in the photo and we all had to try to catch her. Ink: Crumb Cake & Pumpkin Pie Markers, Basic Black ink. Cool Tools: Big Shot, Two Tags Die, Scallop Squares Duo Bigz Die, Pear Pizazz 1/8" Taffeta Ribbon, 1 3/4" Circle Punch. Wow can you believe it - 7 weeks till Christmas. 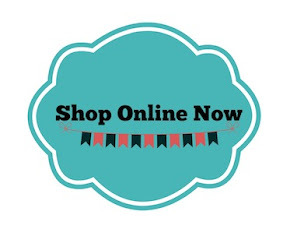 I have not even started to think about shopping for Christmas yet either. Best get started soon or else it will be here and I will be empty handed! 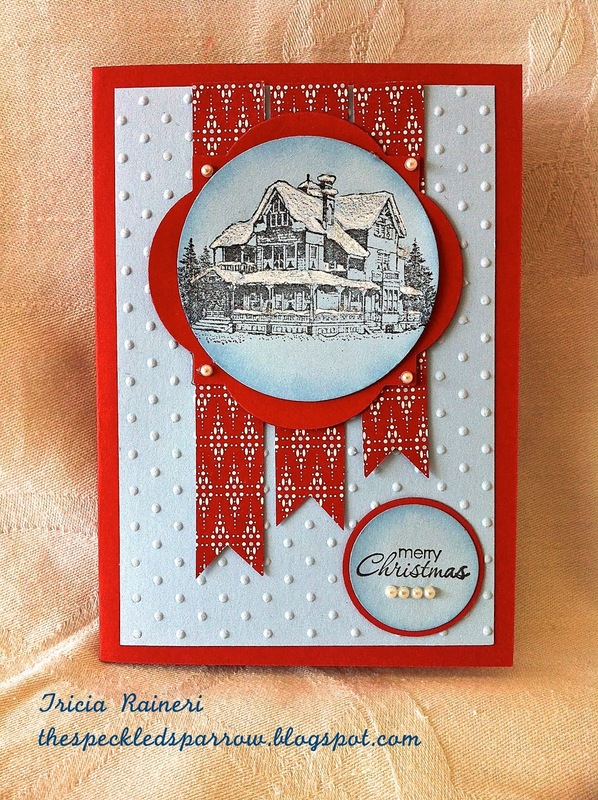 Here is my week 5 post - Diamond fold Snowflake Soiree card. This is quite an easy fun fold card to create and can be done without a score tool if you don't have one, although it is much quicker if you do. I played around with different ways of inking up the snowlfakes from craft white ink to illuminate ink but my best result was with my own concoction. 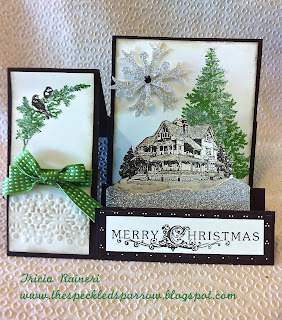 The snowflakes were stamped in Versermark & then I used my own special recipe of embossing powder. 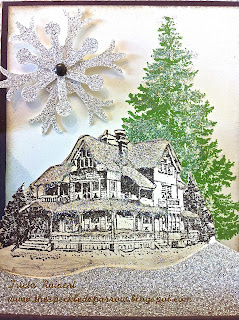 2 teaspoons of white embossing powder and 1/4 teaspoon of Dazzling Diamonds. Boy does it sparkle! It's very hard to capture in photos but the last one does capture some of it. Ink: Versermark, White embossing powder, Dazzling Diamonds. Cool Tools: Simply Scored Scoring Tool, Rhinestones. 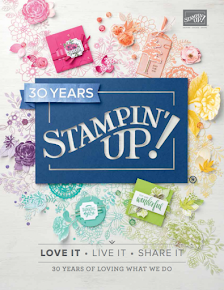 Well Stampin' Up! have outdone themselves again with their promotions this month. Yes, there are two! 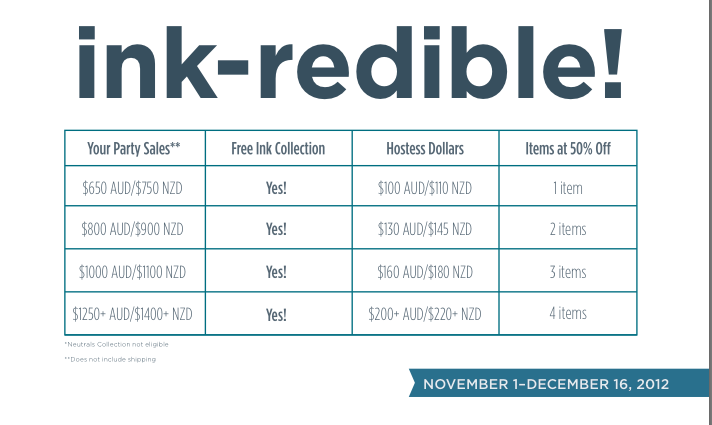 The first is the Inkredible promotion where, if you host a qualifying party you get a free collection of ink pads! Wow that is a whole colour family of ink pads FREE! 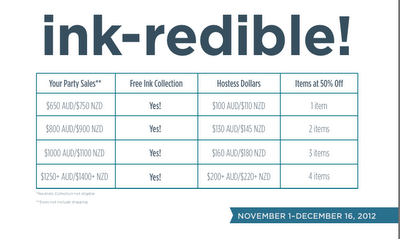 Plus you also get any qualifying hostess $$ to spend as well - now that is ink-redible! Here is the link to the PDF document. The second promotion is yet another amazing offer. 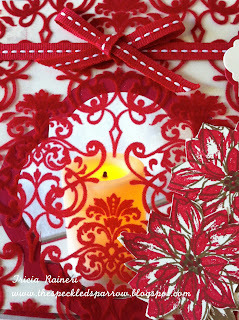 Do you love the ornament on the front cover of the holiday mini? 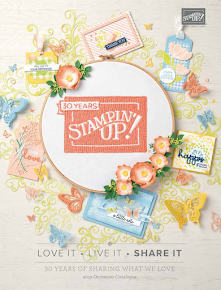 Don't own that stamp set yet? Then this one is for you! 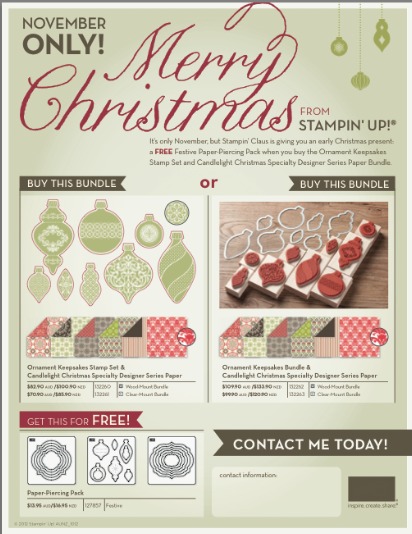 Simply order the ornament Keepsakes bundle and Candlelight Christmas DSP or the Ornament Keepsakes stamp set and Candlelight Christmas DSP you will receive the Festive Paper Piercing Pack FREE! Two great promotions to kick off your Christmas creations. Contact me today on 0411113530 or email me at ftaraineri@bigpond.com to place your order of find out more about these amazing offers!